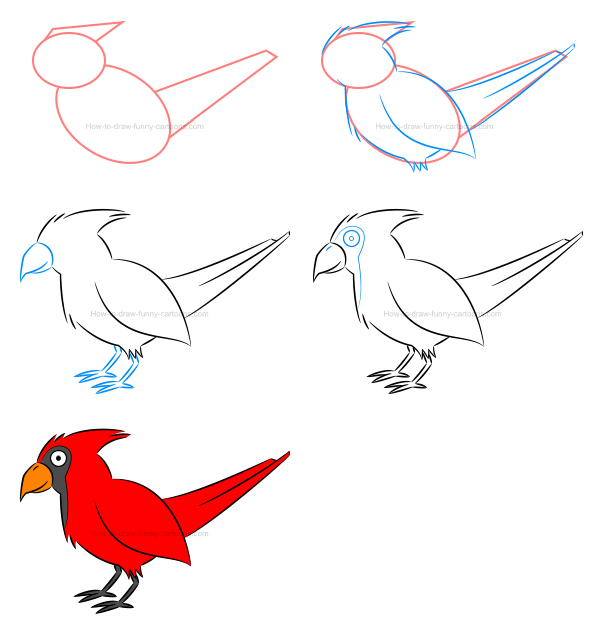 You can now learn to draw an illustration of a cardinal using simple elements and then see how you can enhance the character using more advanced techniques! 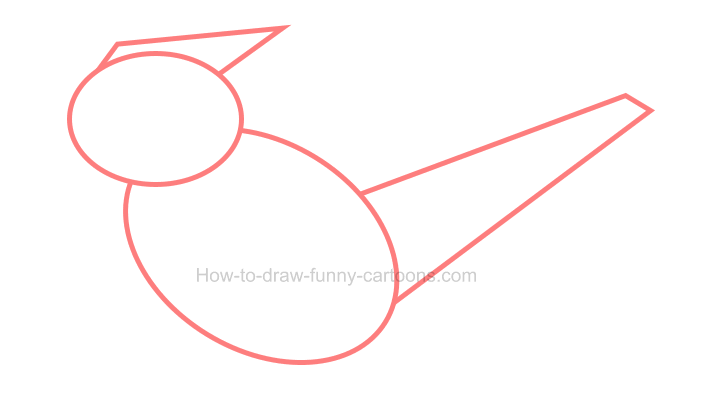 Indeed, once you are familiar with the basics of how to draw this bird using shapes and plain colors, I will show you how to create beautiful shadows, highlights and textures to make this character even more appealing. The beak must be large and slightly pointed near the end. Some hair can be found near the eyes. On top of the head, long hair are visible facing the back of the character. The back is round and made from long curved lines. The tail is pointed and up in the air. The wing is large and also made from long curved lines. The legs and feet are delicate and filled with a dark grey color. The stomach is also round and short. A large dark patch can be seen around the eyes of the cardinal. First, it can be a good idea to create a basic template made from simple shapes to help us draw accurate proportions. You can start by sketching the head using a large oval shape. Then, add the body using a long and large oval shape. On top of the head, create the hair using a triangle. The tail is made from a long and thin rectangular shape. Using mostly long curved lines with both ends being pointed and sharp, create this illustration of a cardinal as shown in the example below. Don't forget to add hair near the eyes, on top of the head, on the stomach and above the legs. Also, pay attention to areas like the tip of the tail and the bottom of the wing. 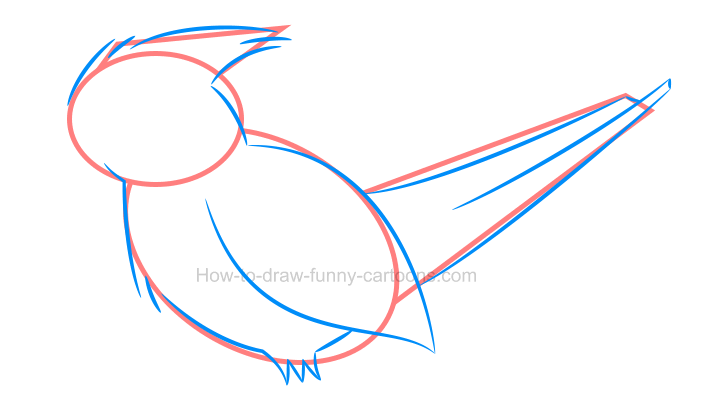 Sketch the beak using a wide variety of small curved lines. Make sure that the tip of the beak is sharp and pointed. Then, draw both legs using a mix of long straight lines and short curved ones. 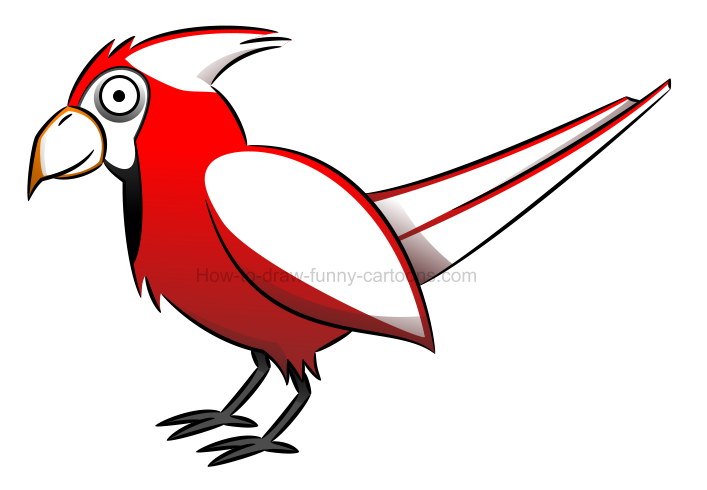 To create a simple sense of perspective, make sure that the leg added behind the illustration of the cardinal is drawn higher than the one found in front. Sketch the eye using a small and solid circle. The pupil can be represented by a simple dot. Next, create the patch around the eye of the animal using more curved lines. The nose is illustrated with a simple line found above the beak. Excellent! All we need to do is add some colors inside this cute illustration. step 5 - red is the selected color! Yes, we need to add a bright red color all over the place! The exceptions are the beak that can be filled with a saturated orange color and the patch that must be colored in grey (a dark version). The legs and feet are also colored in grey. 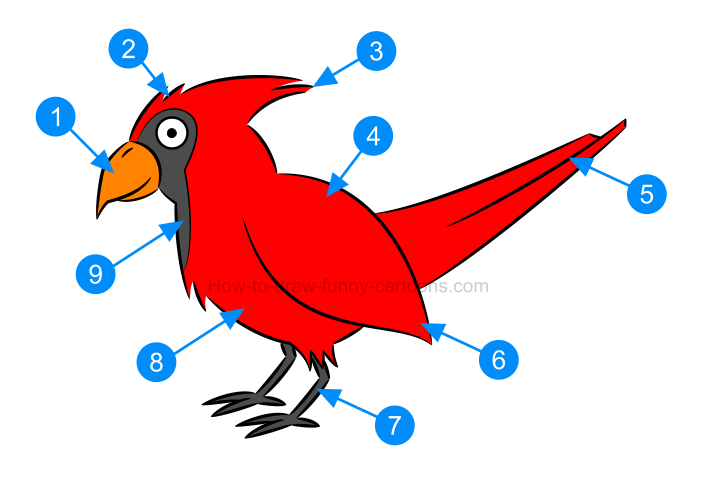 That's it for this lesson on how to draw an illustration of a cardinal made from basic elements. Let's proceed with the second part of this lesson. Can we make this cardinal more realistic? 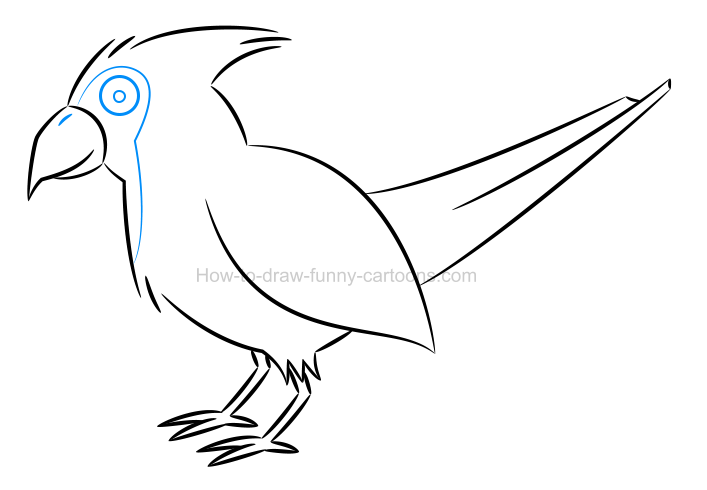 You can see below all five steps required to illustrate this bird in just a few minutes. The result is a nice cartoon version of this animal strictly made from simple shapes and colors. Let's see what it takes to make this illustration visually more realistic and at the same time, more appealing. If you are working with a digital application, then the first thing you can do is add a gradient fill on all elements found inside this picture. The goal is to make the bottom of most shapes darker and the top brighter to create some volume. Of course, this simple effect can also be done manually using markers or pencils. Some areas of this illustration of a cardinal are not exposed to the (virtual) light source. That's why it can be a good idea to create a few shadows to create more depth. 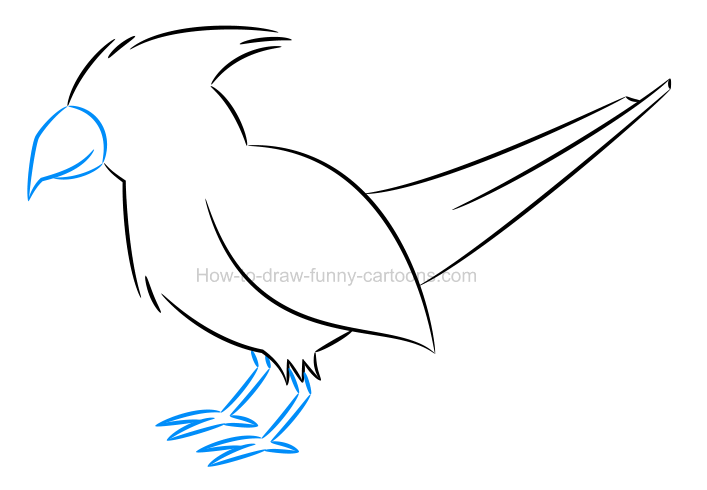 Simple draw new solid shapes on areas like the tip of the beak, below the hair, on the bottom of the wing, on the tail and above the legs. These new shapes are great, but clearly too dark to create a realistic character. That's why it can be a good idea to add a little bit of transparency to make the whole thing more genuine. As you can see in the illustration below, shapes were drawn like (A), but now needs to be partially transparent like (B). Simply compare the bird found below with the previous one to see the difference. Dark areas are nice to create depth and volume, but creating highlights can also help make the character even more enjoyable to look at. For this step, simple add new shapes filled in white is places like the top of the head, around the eye, on top of the beak, on the wing and on the tail. Just like we did with the shadows added on this illustration of a cardinal, we need to add some transparency to these highlights to end up with a realistic effect. It's a simple technique that can be quite effective when used properly and with care. So far all lines were filled with a dark black color. It's not a bad thing, but we can make the whole cartoon illustration visually more interesting by adding new colors on these lines. For lines used to create all red shapes, you can select a dark red color on all outlines. The beak can be surrounded by dark orange lines and the legs by dark grey strokes. To make this illustration of a cardinal even more enjoyable, adding textures can be a good idea. No need to draw something complex filled with a few thousand lines to end up with a cool result. Just a few strokes that are created in strategic areas are enough. 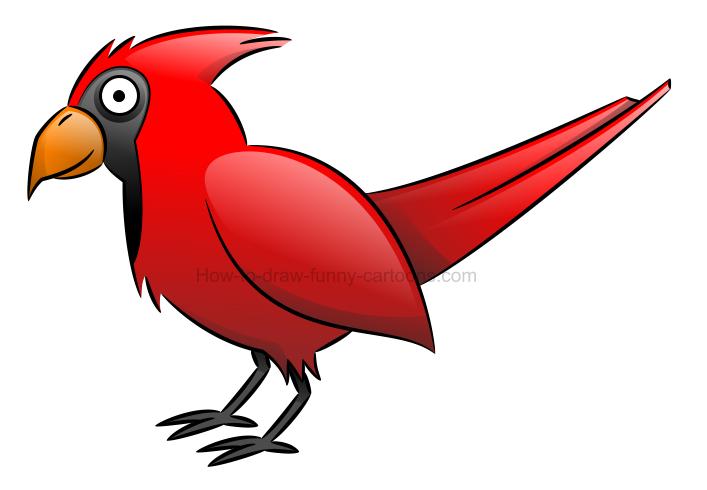 A nice cartoon cardinal filled with basic effects is all we need!